Nothing completes a Seattle summer day like a meal of fresh caught Dungeness Crab. Freshly caught Dungeness Crab is classic Pacific Northwest cuisine. 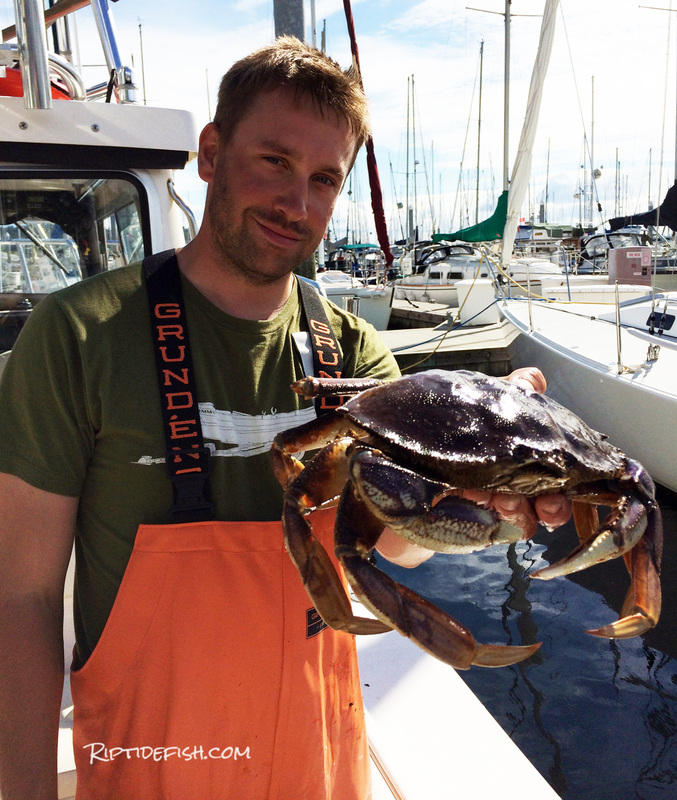 Are you ready to learn how to cook Dungeness Crab? 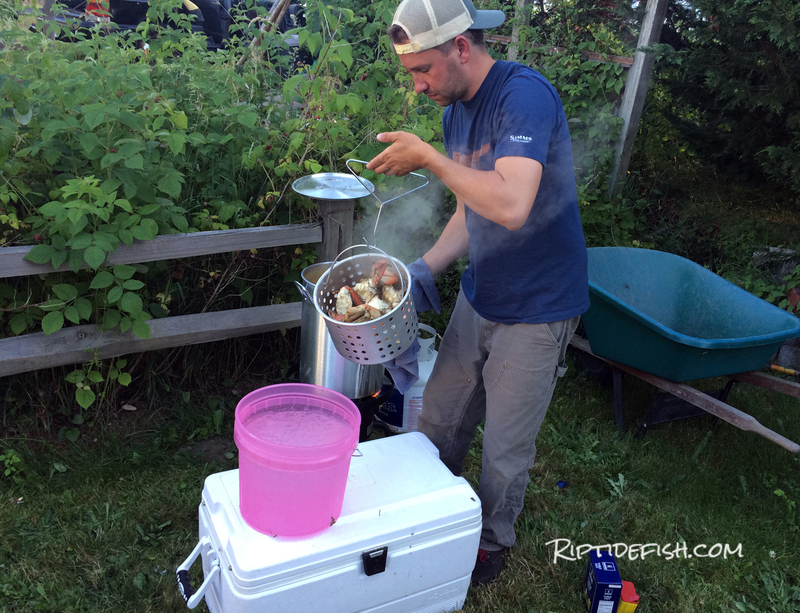 During the Seattle summer, my favorite ways to spend a day is crabbing on Puget Sound in the morning and inviting over friends and family for a crab boil in the evening. Those calm summer days on the water make crabbing here pretty trouble-free. And the bounty we catch is usually enough to feed at least a couple people. 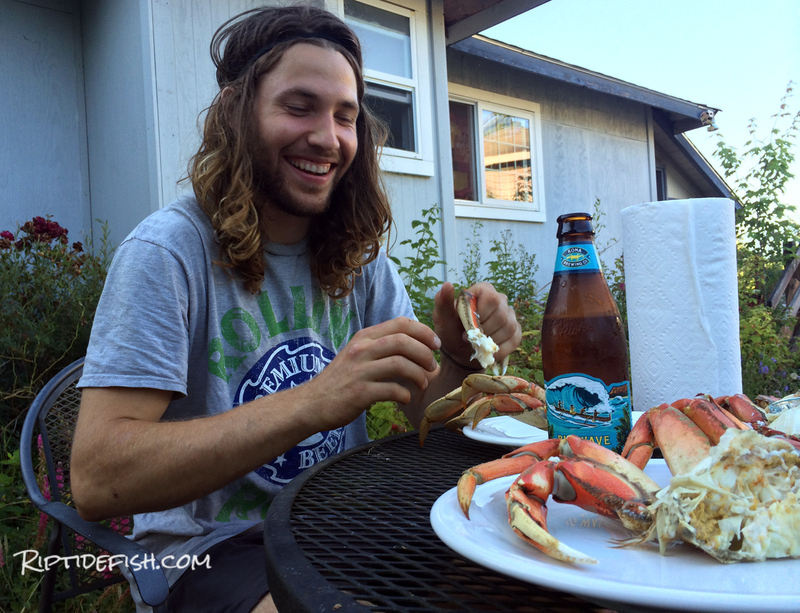 Cooking Dungeness Crab is easy and a great way to share the whole hunter-gatherer vibe with others. 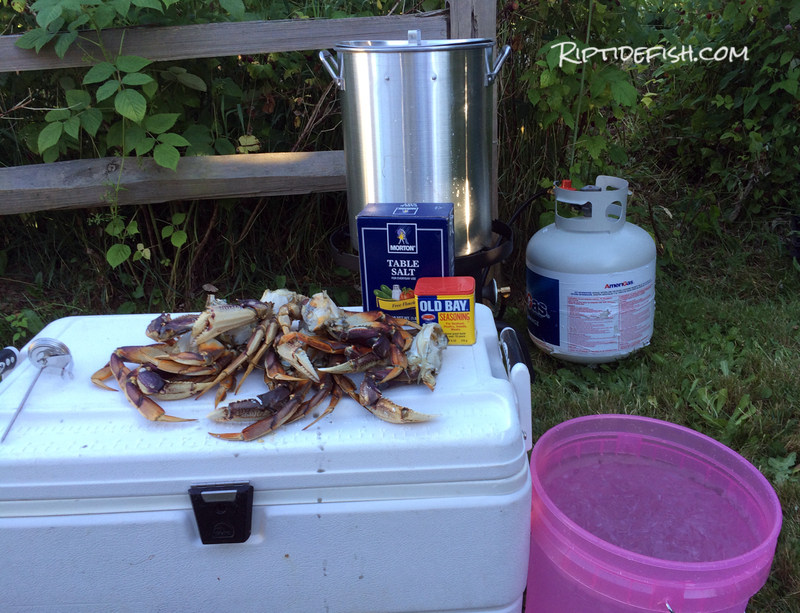 You don’t need much equipment to cook crab, add in a little prep time and you are there! I suppose you could head to your nearest high-end grocer and buy a few live crab, but cruising around and pulling crab pots on Puget Sound is way more fun and fulfilling. 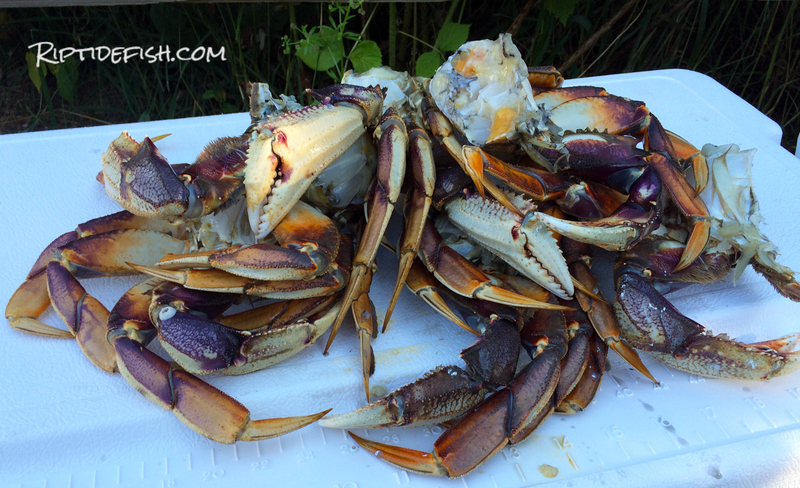 If you want to get familiar with our local Seattle area crabbing, check out my post about Puget Sound Dungeness Crabbing. If you need help with gear, my post about Crab Pot Rigging and Setup might be helpful. 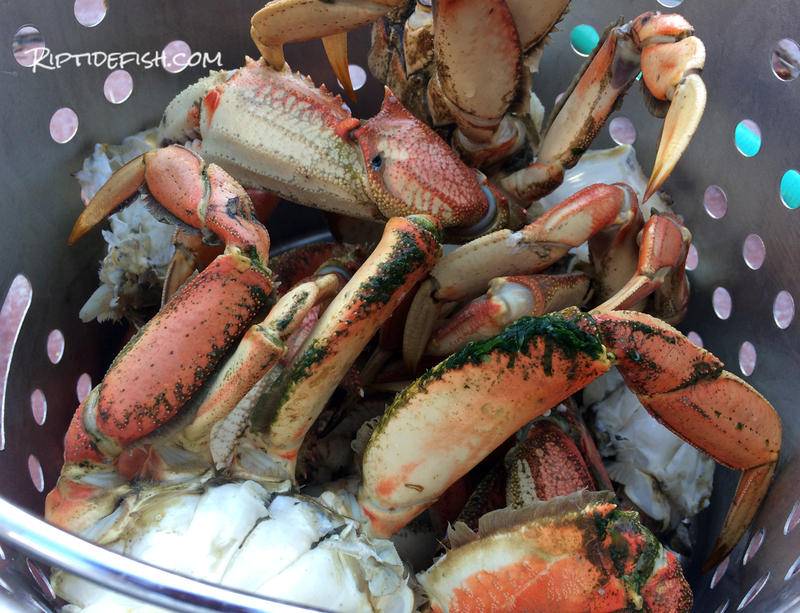 Catching Dungeness Crab in the morning means a crab boil in the afternoon! What Do I Need To Cook Dungeness? First off, you need fresh live Dungeness Crab – obviously. You need something to cook them in and a heating element. I like to cook crab outside during summer months. 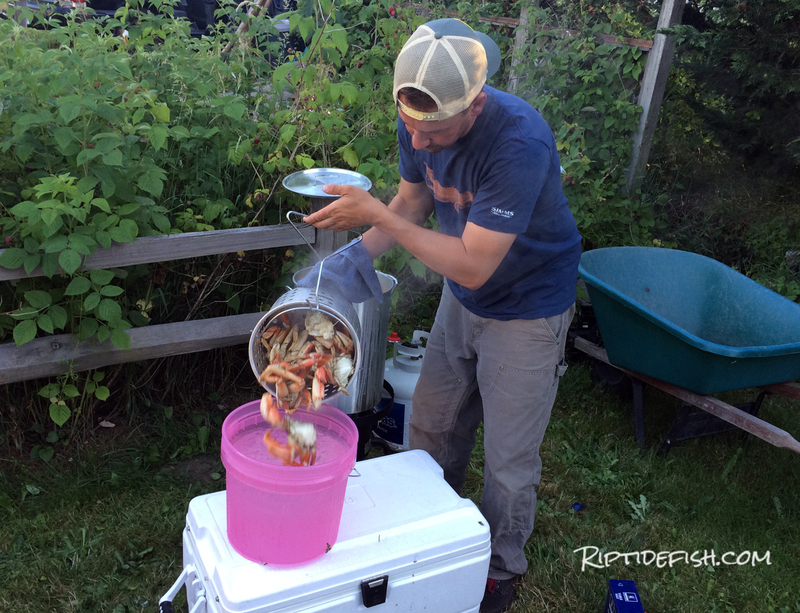 I use a propane burner and a 30 quart aluminum pot, it includes a nice aluminum basket that makes lifting out the crab easy. The bigger the pot the better (I’ll explain later). You need salt and seasoning for the boil. The best tasting crab I have ever had was boiled in pure sea water. Dungeness live in the saltwater environment and if you cook them in freshwater you will draw out most of that great salty sweet flavor that Dungeness are known for. I use Kosher Salt and Sea Salt and season the water until it tastes like seawater. This isn’t an exact science. I love adding Old Bay Seasoning to the mix as well. I don’t usually add much more than salt and Old Bay Seasoning because I don’t want to mask the rich flavor of the crab meat. Other items include tongs or something else that can lift the crab out of the boil, and oven mitts to protect your hand from the steam of the boil. Once the Dungeness Crab are cooked and ready to serve, a couple pairs of crab crackers will be helpful but we often use a heavy fork to crack the crab. Finish off your table setting with some melted butter and get ready to dig in! Prepare an ice bath to quickly chill the cooked crab when they come out of the boil. Here is my cooking arsenal for a backyard Dungeness crab boil. A big decision needs to be made: do you boil the live crab whole or clean them first? I like to boil them whole because it adds a layer of flavor. Many people like to clean and halve the crab prior to cooking. It is personal preference. More on cleaning crab later. Whole Dungeness Crab will take a little longer to cook (usually 12 to 15 minutes in the boil), cleaned Dungeness halves take a little less time (usually 10 to 12 minutes). Live Dungeness Crab that is ready for the cooker! Make sure you have everything on your checklist in order. Mix in the salt and any seasoning to the water, fire up the burner and get the water to a rapid and rolling boil. Prepare for your crab boil. Pour in salt, Old Bay Seasoning and anything else for flavor. 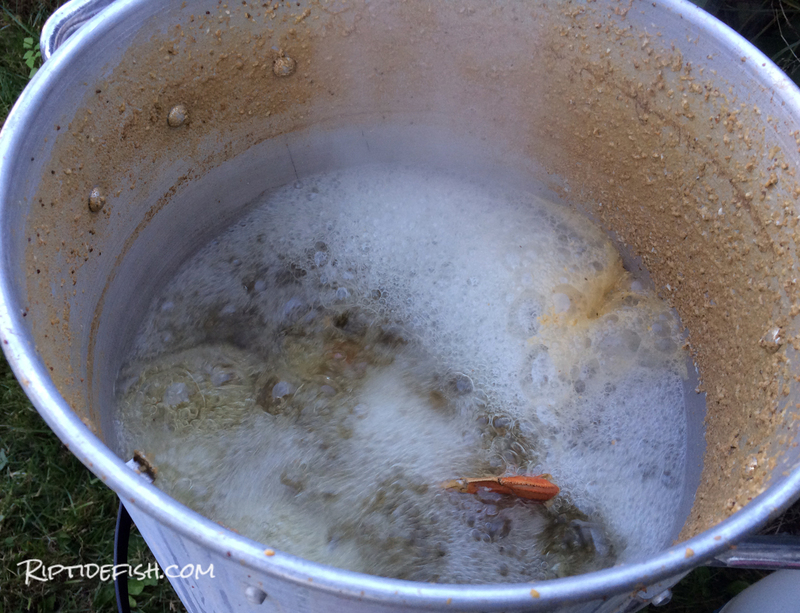 Once the water is at a rapid and rolling boil you are ready to add the crab! 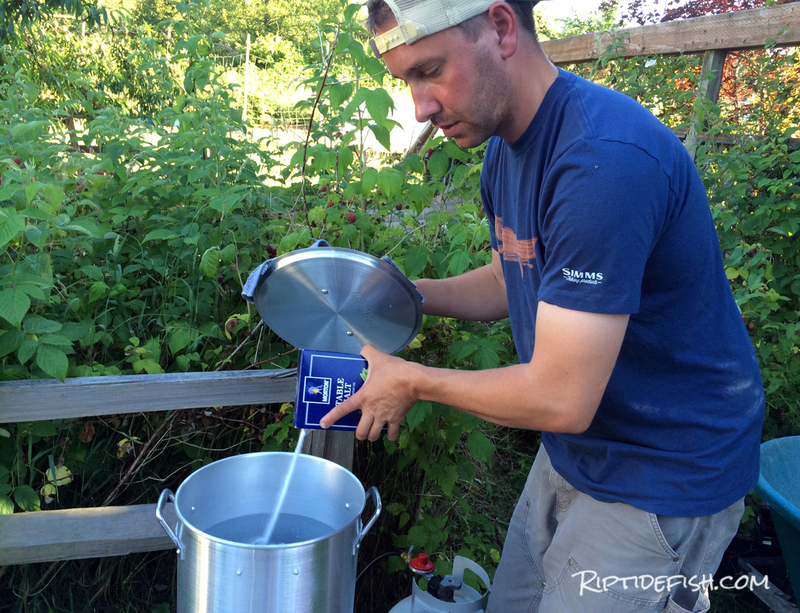 Adding the Dungeness Crab to the boil will cause the water temp to drop significantly. I like using a large pot with a lot of water because I can drop in a few crab without having the water temp drop too much. Timing is everything. I usually give the crab 12 to 15 minutes in a boil. If the boil dies when I drop in the crab and it takes a couple minutes to get going again I will give it a little longer. Once you go through this process a few times you will have a good feel for it. I like a rolling boil for cooking Dungeness Crab. Once the Dungeness Crab have spent enough time in the boil cooking, it is time to remove them from the pot. I love my cooker setup because it has a strainer basket that can lift everything out quickly. Be extremely careful when pulling out the crab and avoid getting burned by the steam. You may want to turn off the burner a few minutes before you pull the crab out to kill the boil. Be very careful when removing the crab from the cooker! Once I remove the Dungeness Crab from the boil, I will dump them in an ice water bath. You are preparing such a delicious meal that you don’t want to overcook the crab. The water inside the crab shells will continue to boil after being removed from the cooker and it is important to get that temperature down immediately. Place the Dungeness Crab in the ice water bath until the shells are warm to the touch. Remove from the ice bath and get ready to feast! Cooked crab needs to be cooled down immediately after it is removed from the boil. You can clean Dungeness Crab before or after you boil them. When I clean live Dungeness Crab I will place them on a cutting board belly up and chop them in half with a hatchet (you can cut them in half with a butcher knife if desired). Be very careful not to get pinched! Then I pull off the large shell, completely separate the two halves, and clean out the gills and guts. Everything not enclosed in within the shells of the two halves needs to be removed before eating. When you clean them after they are cooked and chilled, the large back shell will easily come off and you can simply crack apart the two halves with your hands. Clean out the gills and guts and get ready to serve! I decided to clean the crab before cooking them. You can do it either way. Dungeness Crab are used in many different recipes. My favorites are Dungeness Crab Omlettes, Dungeness Crab and Brie dip, Dungeness Crab Cakes and Dungeness Crab Chowder. Most of the time, we simply enjoy sitting around the table, cracking crab and enjoying the fresh crab meat dipped in a little melted butter. Nothing is better! Please feel free to share any recipes or ideas in the comment section below, we would love to hear from you! 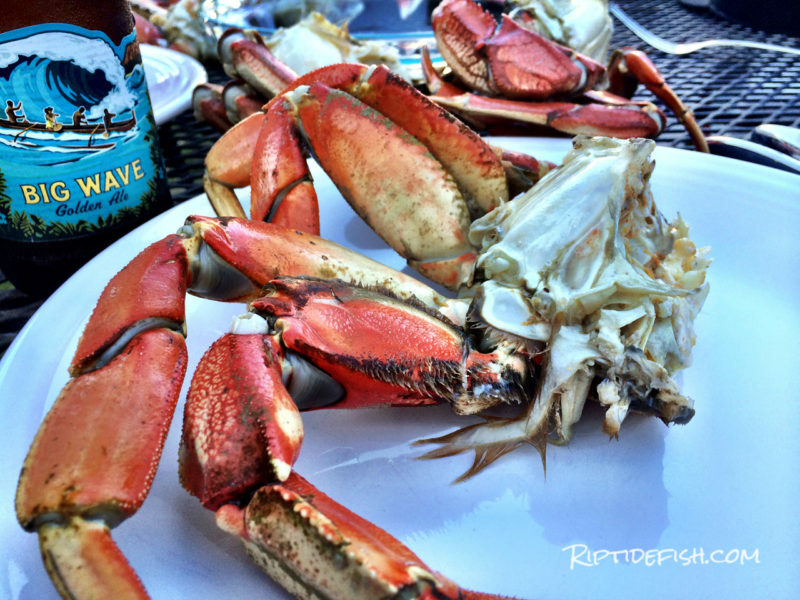 My favorite way to eat Dungeness Crab is with nothing more than a cold brew and a dish of melted butter for dipping! 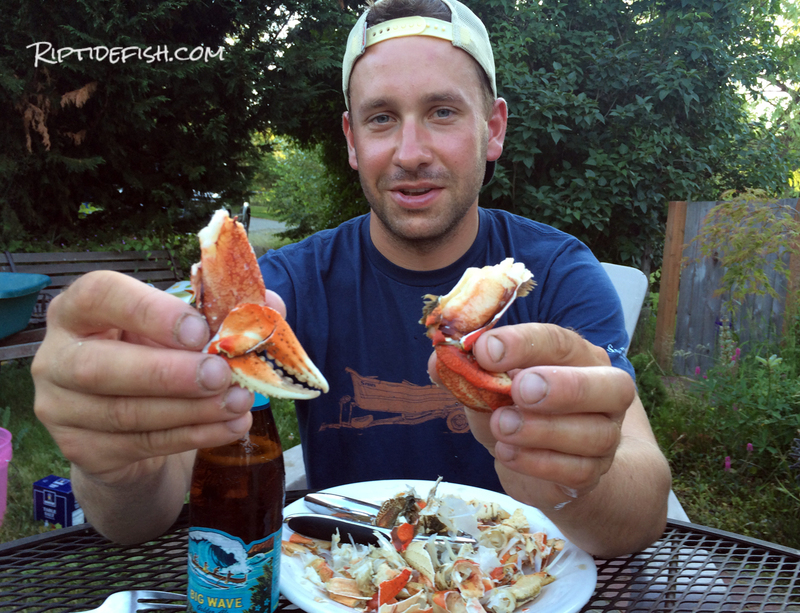 Fresh Cooked Dungeness Is My Summertime Favorite! Younger brothers love it when you invite them over for fresh Dungeness! 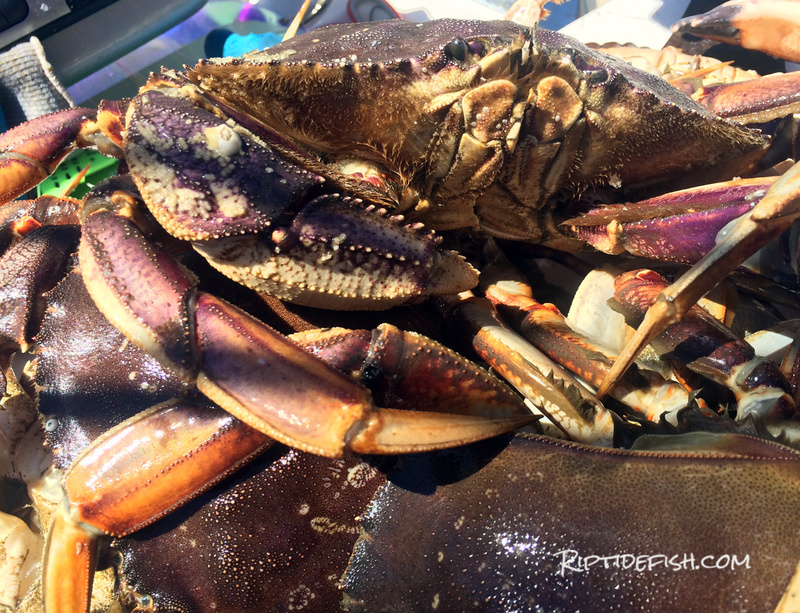 What Is Your Favorite Dungeness Crab Recipe? Please Share Below!